To emerge from under the wet, grey blanket that has hung over Europe recently into the Californian light was like switching from black and white to technicolor. 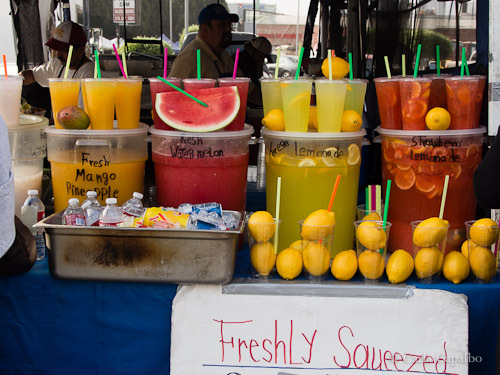 Everything was saturated with colours and flavours that just can’t be found in northern European winters and springs. It had been years since my last trip there, and I was curious to check out the food scene. My hosts in San Francisco, Gary and Jim, booked a formidable line-up of restaurants to visit, starting in Oakland with Camino (if only it was in my local neighbourhood…), and ending, six nights later, with the newly opened and stunning Saison. 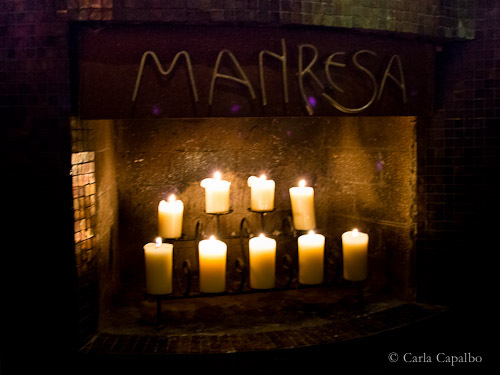 Our exciting food journey took us south to David Kinch’s Manresa and into the heart of San Francisco to Daniel Paterson’s Coi. Both Daniel and David have become friends in Europe in recent years and I had been longing to visit them in their own kitchens. I wasn’t disappointed! Each produced wonderful meals in their own distinct styles. 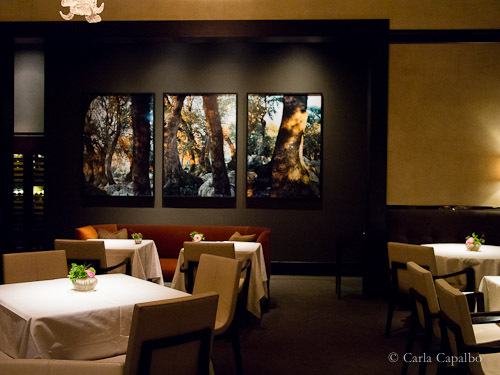 Gary and Jim introduced me to some of their favourite restaurants, with a sunny day trip to Napa ending in the comfort of Meadowood Hotel’s spectacular dining rooms, and a stylish supper in SF at sophisticated Quince. I’ll be writing more about these memorable meals soon. Our only disappointment was down to bad luck: three days before our dinner reservation at Chez Panisse, the restaurant’s porch caught fire and the restaurant was closed for the whole week I was in Oakland. Next time, Alice! I always enjoy LA too. It feels exotic yet familiar, with some of the laid-back vibe that Greenwich Village used to have. I ate well in some of its casual, buzzing restaurants – including Red Hill and Mozza – with my brother, Marco. The best meal I had in LA this time was in Santa Monica at Rustic Canyon, where chef Jeremy Fox really knows how to be imaginative with the vibrant local vegetables. 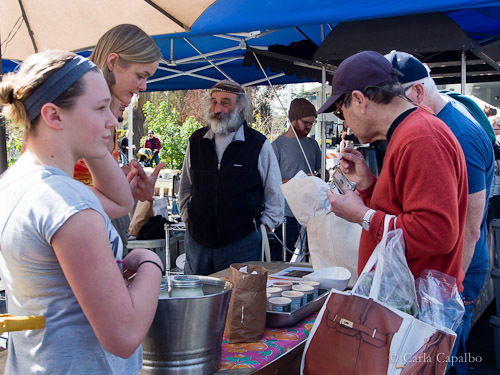 Those vegetables were a common theme in visits to local farmer’s markets in both SF and LA. Marco is an habitué of the Sunday market in Hollywood where we shopped for organic vegetables to the sounds of live music. I’m really envious of the quality and choice of bright, sun-reared produce California can offer – so different from the pale taste of the UK’s winter offerings. It’s that time of year: as winter sets in and we huddle around our fireplaces (or hot radiators) I often think of pigs. 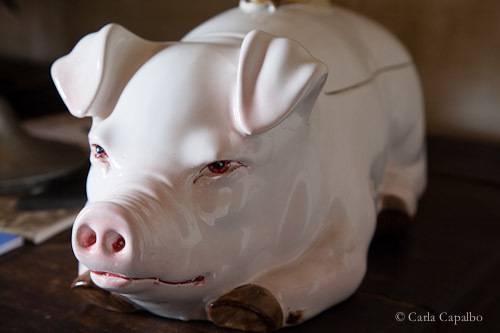 In Italy and other countries where people still keep a pig for home use, killing time is nearing. Traditionally, in pre-refrigerator times, the pig was always slaughtered in early January or February, when the air was cold enough to stop the meat from spoiling. The pig was a crucial member of the farm: by keeping them fed all year on home-grown corn and kitchen waste and scraps (the perfect recycling machine), families watched as their pig fattened, imagining the bounty of salt-cured and fresh meats the animal would bring them. To some families this was one of the most valuable assets they had. No wonder that, despite keeping the animals close at hand, in pens just behind the back door, they rarely give their pigs a name. One old man I met in Calitri, in the mountainous inner region of Campania, proudly took his pig for daily walks on a leash ‘to do his business’ yet he was scandalized when I asked what the pig was called. “Pigs don’t have names,” he grumbled, as he scratched the giant pink animal’s tummy like a dog’s. 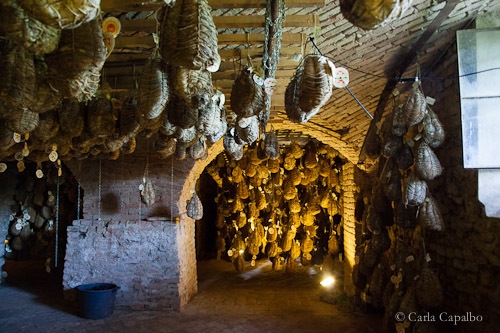 In a recent visit to Emilia Romagna for the food and wine fair, Enologica, the pork cuts on offer were many and included a few surprises. 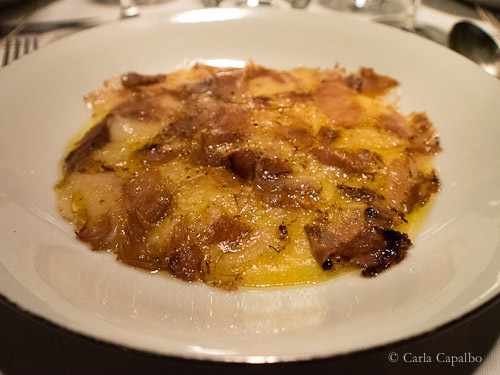 I had feasted on Antica Corte Pallavicina’s platter of aged culatelli before. 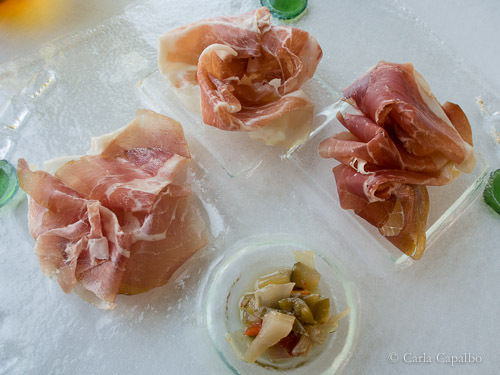 This salt-cured heart of the pig’s hind leg is known as the king of salumi, and is matured for many months – even years – hanging in the moist and mouldy cellars of the atmospheric palazzo on the banks of the Po river. Of the three ‘vintages’ I was offered this time (18, 27 and 37 months) I preferred the 37-month culatello made from the leg of a black pig. It was sliced paper thin and draped softly on the plate. A deep rose madder, it regaled us with mellow flavours of caramelized sweet molasses and earthy, truffley leaf-mould to complement the pork’s fine character. 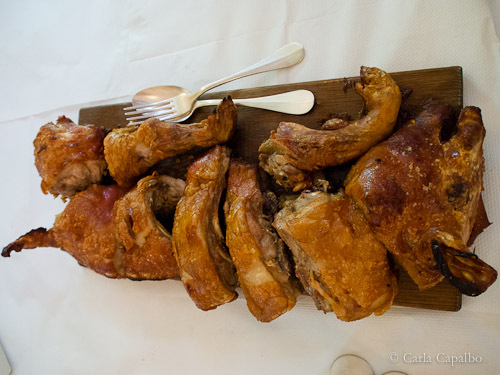 At the historic trattoria, Amerigo 1934, in the village of Savigno, near Bologna, a seasonal recipe celebrated the ‘day of the pig’s investiture’, or slaughter-day. “We always feast the pig’s killing with this dish which features all the parts of the animal’s head: cheek, tongue and eyes, sliced paper thin over steaming hot polenta,” explained the patron. Not for the faint-hearted, this winter warmer came steaming hot, with the polenta basted in the pork’s fatty juices. In London too, the pork season is in full swing. At Hix Oyster and Chop House, baby suckling British pig is on the menu, the whole animal roasted to perfection with crisp crackling and tender meat inside. It’s served on a life-size board with waxy potatoes, mustards and sauces to accompany it. 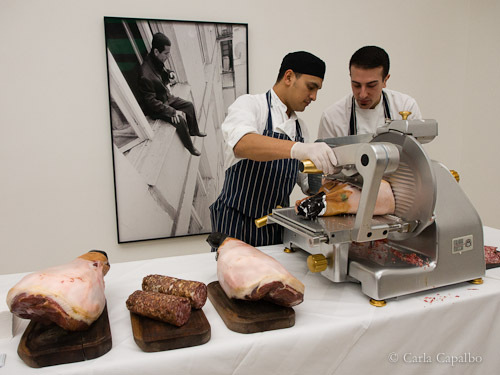 Prosciutto di Parma from Manicomio featured at an elegant wine tasting at the Saatchi Gallery organized by Goedhuis Fine Wines, sliced on Italian machines brought in for the purpose. 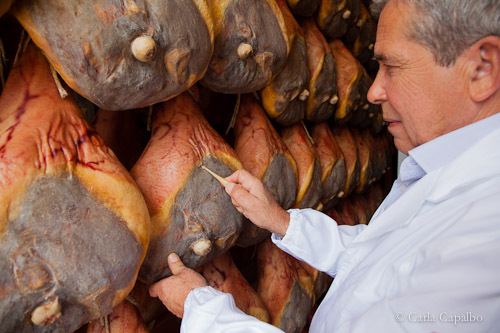 I had just visited a prosciuttificio near Parma, to watch the hams being made, so I was happy to be able to keep feeding my habit. 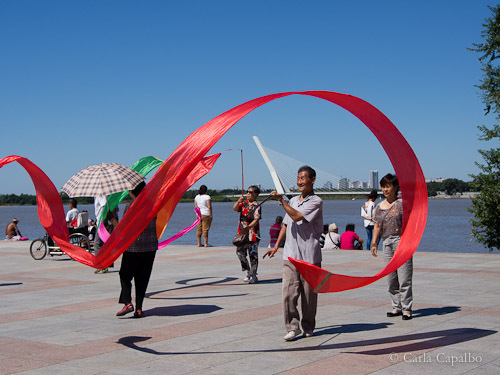 My summer’s travels stretched as far as China this year, a first visit to this amazing country. 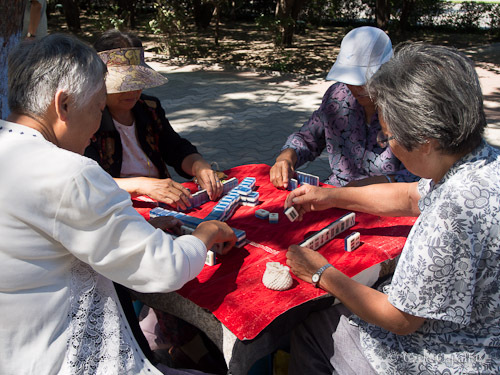 For anyone interested in the minutiae of daily life, as I am, China offers a fascinating range of customs and cultural differences. I think I was most struck by the warmth of the women (foreign women seem invisible to Chinese men), who would come right up to me in the street and want to be photographed with me, and by the way that the Chinese seem refreshingly free of the ‘demons of self-regarding’ that plague many in the Western world. 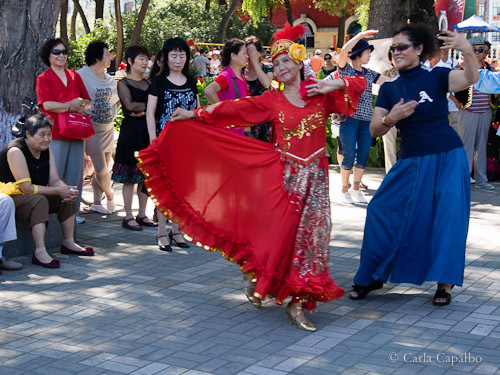 Wherever we went in China we came across people old and young out in the streets, courtyards and parks doing whatever they like to do best: singing in a choir, taking ballroom or traditional dancing lessons, practising Tai Chi or gymnastics. All levels were welcomed, with no shame attached or felt by those who weren’t that good at it. Quite a lesson for the rest of us to pluck up our courage and go for it! As for the food, it was wonderful everywhere we went. I fell in love with the vegetable cookery: silky sweet aubergines, Lilliputian cucumbers small enough for a doll’s house with their own miniscule flowers attached, and bitter greens dressed with scented jasmine blossoms. Beijing can rightly claim Peking duck as its own: the wood-oven version is far superior to anything I’ve had in the West…so many new foods to try and enjoy: I look forward to going back soon.